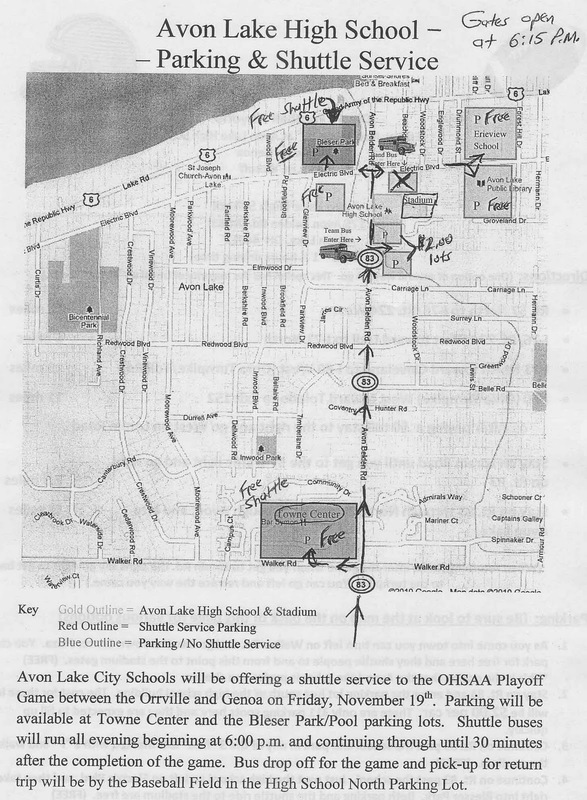 Here's the map provided by Avon Lake and distributed by the OHS athletic office.....click the picture for a full-size, printable version. 1. Note the parking to the east of the stadium at Erieview Elementary and at Avon Lake Library. There's not many spaces at each. 2. If you want the spot with the most parking spots and easiest access to Rt 83...I'd have to guess that it's at the Towne Center Plaza. If you get there early enough, you could take your chances closer to the field, but if you get there any time after 6pm, just head to the shopping plaza and save yourself the headache. 3. Gates at the field open at 6:15pm, shuttle buses begin running at 6pm. 4. Bleser Park has over 200 parking spaces so that's another spacious parking lot. Since it's west of the stadium, I imagine that a lot of Genoa fans will nab those spaces. 5. Any lots at the school will cost $2. Parking is free everywhere else. Shuttle service is free also. 6. Shuttle bus pickup/dropoff is directly behind the home stands near the baseball field. Here's an interactive map of the area if you want to "blaze your own trail" or just familiarize yourself with the area. Again...leave extra time to deal with traffic/parking in and around the stadium. Carpool if you can, and be prepared to walk. Most of all, be courteous.